Planning on renovating your property? Consider installing wood floors! Wood is always a popular choice and lasts for a significant length of time, always giving your property a classic look. Hire the skilled floor fitters in Hammersmith W6 for a professional service that meets all your needs. From the moment you schedule an appointment to the execution of the service, you take the lead and oversee the procedure. What Will You Gain from Our Wood Floor Installation in Hammersmith W6? The first step is to have a team of wood and parquet floor fitters sent around to your property to assess the layout and how the project is going to shape up. In case the floor beneath is not leveled, we can easily perform concrete subfloor leveling to give your wooden floor the proper base. Before the installation, you can get damp and sound proofing for an improved experience once the floor is installed. Then comes the actual floor installation – either glued down, nailed down or floating. For finishing touches, you can order skirting board and beading installation. Who Are The Wood Floor Fitters in Hammersmith? Now that you have decided on installing wooden floors, call 020 3404 9697 to get in touch with the office and schedule your no-obligation on-site consultation. You can contact us every day of the week from Monday to Sunday with the inclusion of bank and national holidays. 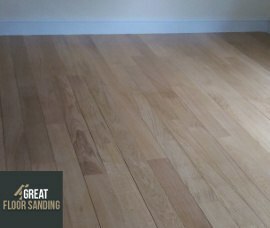 All of the wood floor layers in Hammersmith are here to help you create a unique service package and accommodate all your needs whether you want more information regarding our services or want to make alterations to an existing appointment.